Merry day after Christmas! I’ve said it before, but this might be my favorite day of Christmas. I love all the family, friends, and festivities too! But the stress is over today, no more mad food prep, chaos, worrying about gifts, rushing to parties, etc. 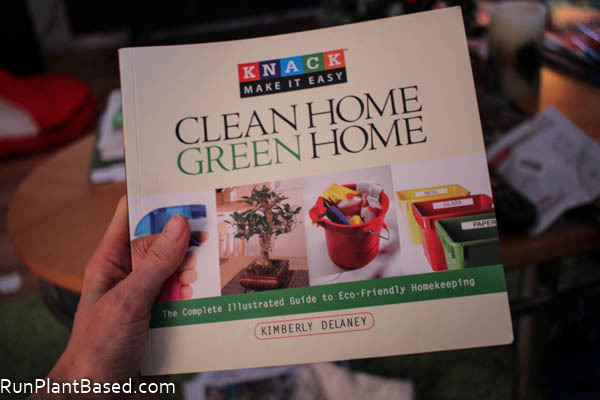 Just enjoy gifts and decorations, maybe catch up on Christmas movies, and relax. I plan to get back to the gym today and thank goodness! 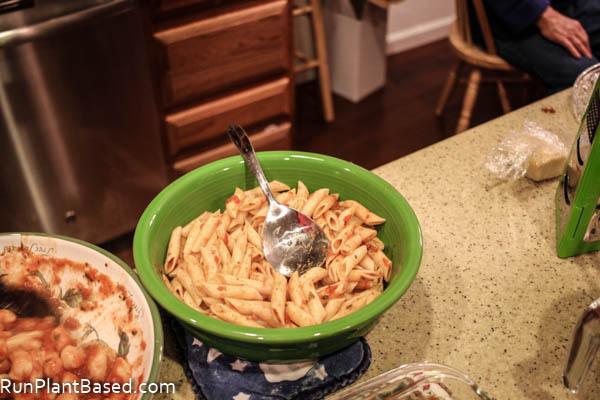 We had a large family party at one of my sister’s houses on Christmas Eve and another smaller gathering on Christmas Day which were both great and I scored plenty of goodies and ate plenty of great food. 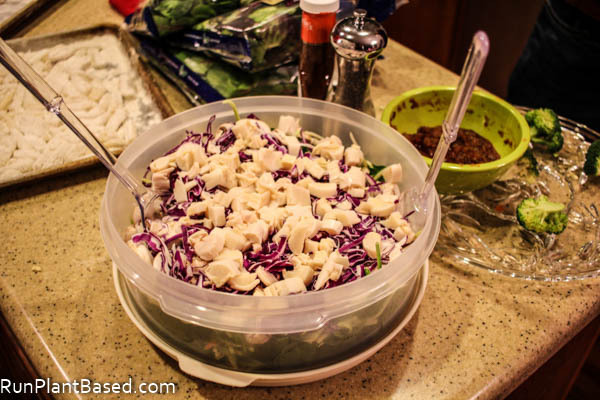 We had salad, of course. 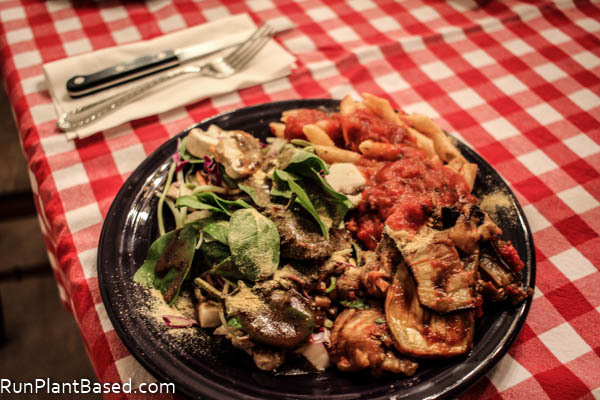 My sister made great vegan eggplant Parmesan for a loaded plate on Christmas Eve. 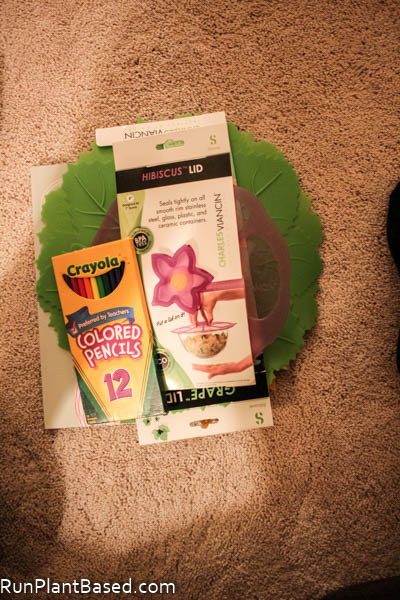 And I scored an adult coloring book and great Hibiscus Silicone Lid Set for sealing plates and bowls from our family white elephant gift trade. 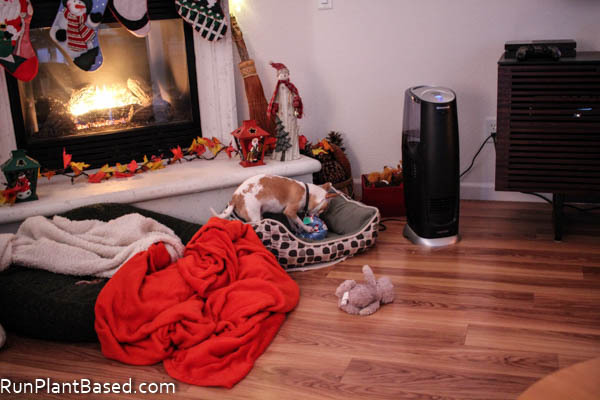 Christmas morning was fun and relaxing for us, Miko tore into his new toy gift. 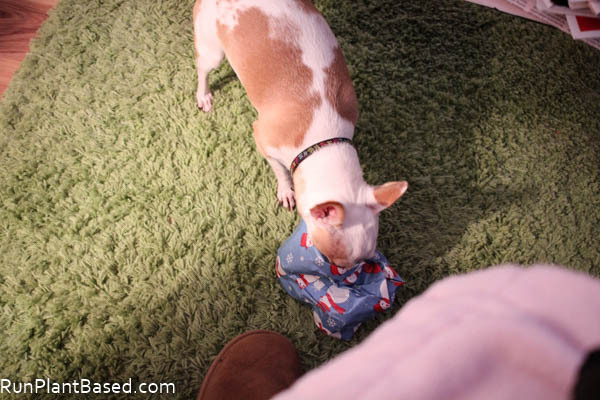 And savored the process of getting all the wrapping paper off. 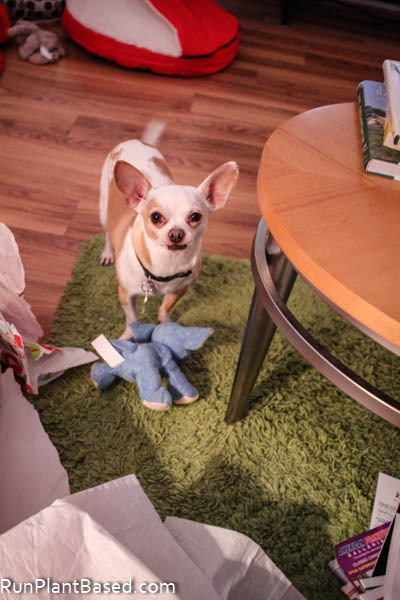 Then eagerly brought his new blue elephant to us to play fetch. 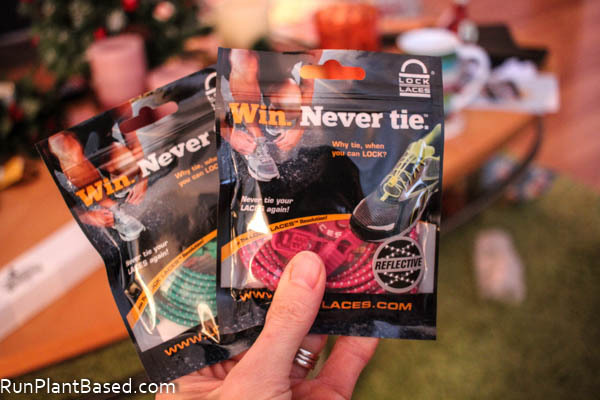 I scored Never Tie Lock Laces to try on my running shoes from hubby. 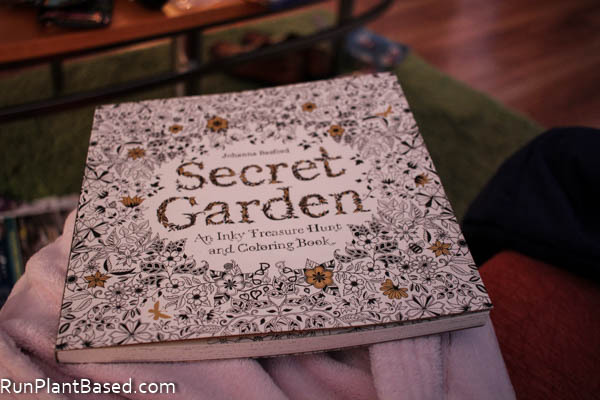 Secret Garden Adult Coloring book from hubby. 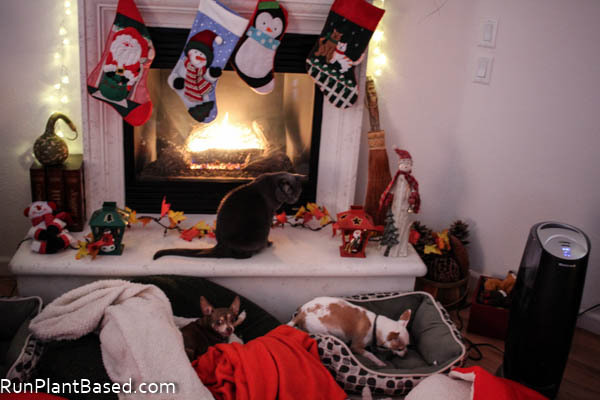 The fur kids were happy to enjoy new treats, toys, beds, and the fireplace. 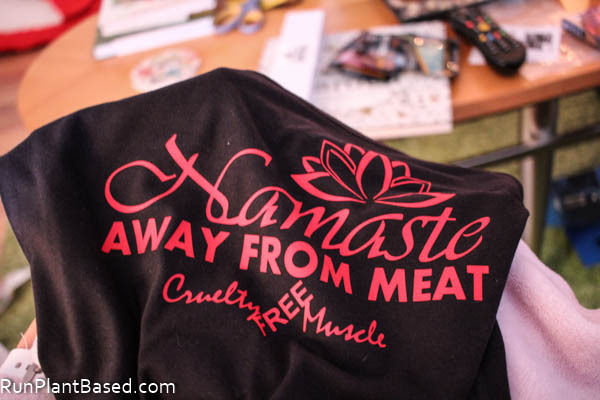 A new workout tank for the gym from hubby which I adore! 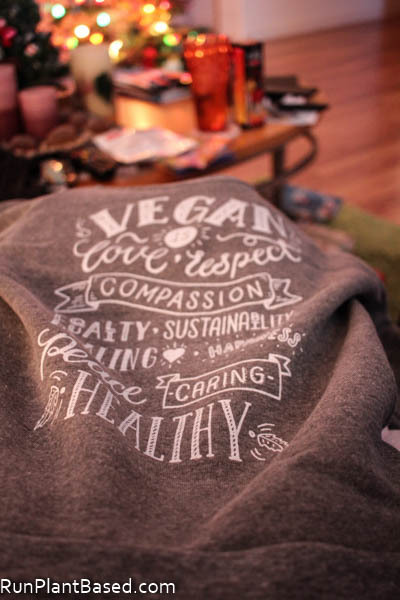 A new sweatshirt from hubby too which I’ve wanted since seeing it on the Alaskan Cruise. And new running books from hubby! 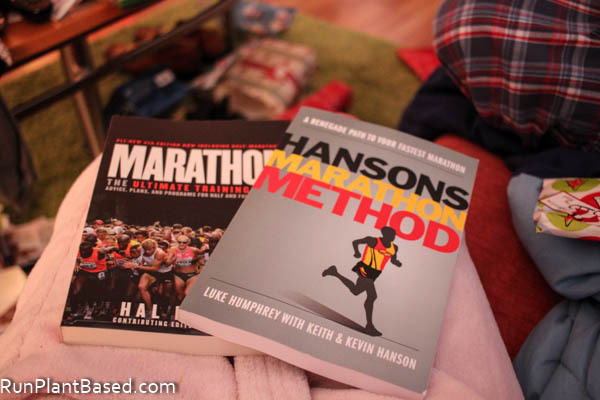 Marathon: The Ultimate Training Guide and Hansons Marathon Method! 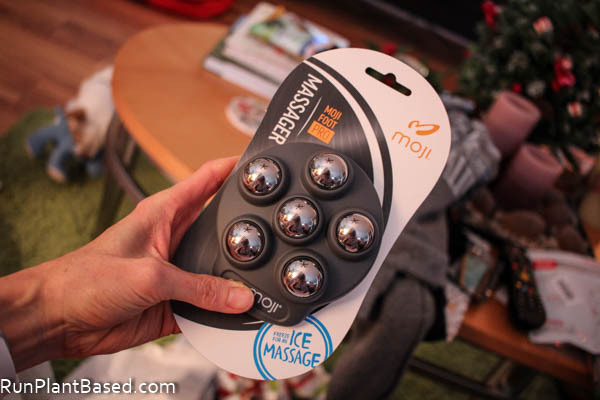 A Moji Foot PRO Stainless Steel Massager. 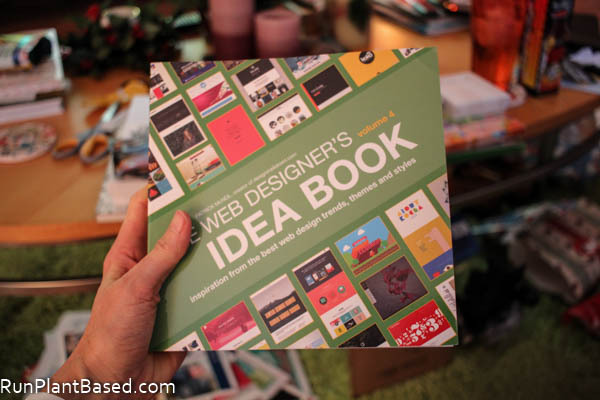 The Web Designer’s Idea Book from hubby too! 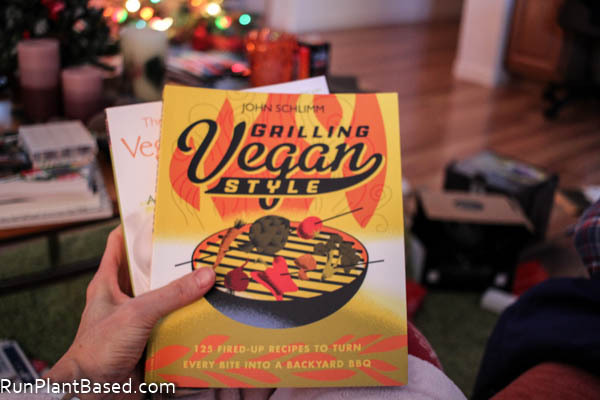 The New Vegetarian Grill and Grilling Vegan Style so hubby and I can get a little more creative with the grill this summer. So I’ve got a lot of reading to look forward too! Christmas morning breakfast was pretty awesome too because I tried my first homemade vegan french toast recipe and it was a success! 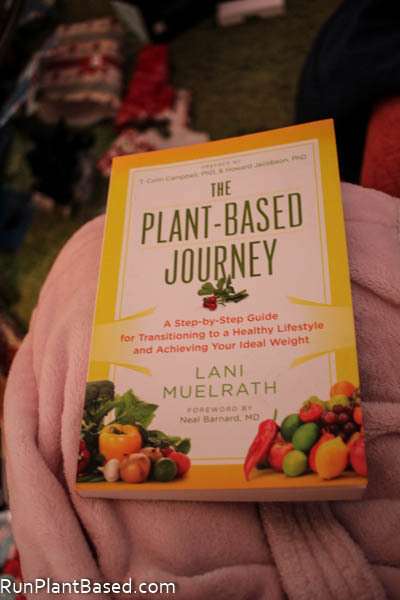 Christmas morning is one of the few times I deviate from kale-loaded green smoothies for breakfast. I picked this french toast recipe because it seemed simple and didn’t require a crazy list of ingredients. 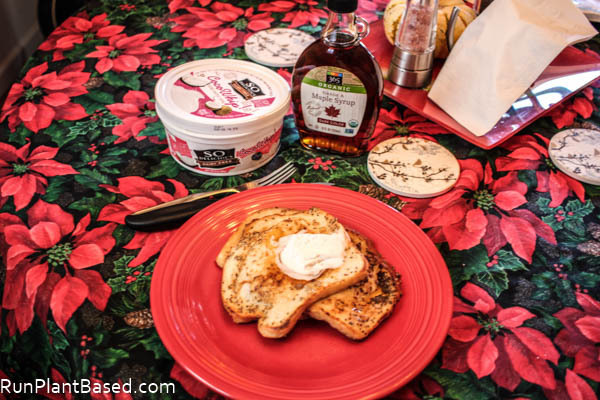 I did splurge on real maple syrup and good, local sourdough bread from Whole Foods for it. 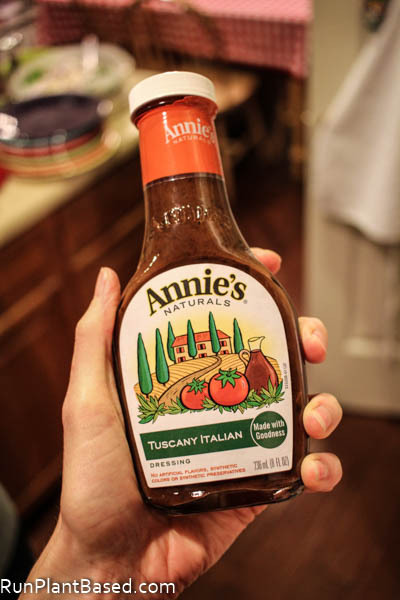 The sourdough bread really added to the flavor and texture with sweet, crisp edges and a gooey, savory sour middle – just great and hubby declared it’s a recipe we must keep in the rotation. 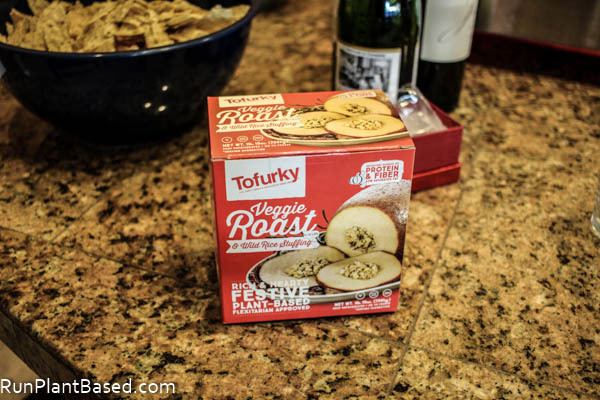 We kept Christmas Day dinner simple with the Tofurky Veggie Roast and vegan Savory Gravy to prepare with the family’s non-vegan dishes. Hubby did an awesome job of preparing and roasting it over a bed of potatoes and veggies seasoned with fresh herbs and I had a loaded plate with it, veggies, salad, and vegan stuffing. Whew! 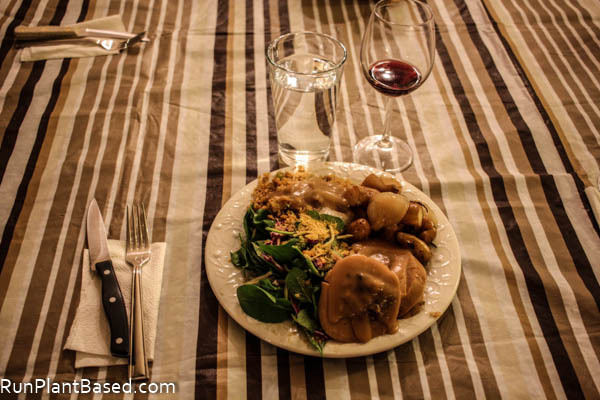 And non-vegan family had great things to say about the roast too, it was savory, hearty, and loaded with great wild rice stuffing in the center. Christmas was awesome, lots of great family, friends, and festivities. I am a lucky girl to have so many wonderful people in my life! I hope everyone had a wonderful holiday! Looking forward to getting back to it this week and focusing on goals for the new year! Thanks and it was! Agreed, I consider it Christmas up until the end of December and it gets more relaxing and fun after Dec. 25.